I hope to join your outdoor tea. I love your newly painted cane chair- it's great and that lovely teacup looks happily situated right on it! I have so much going on right now, Terri, but I will try to join you on the 25th. Your Garden Party sounds like it's going to be dreamy. Love the chair and all the lace. It's fun to plan a tea party, I know. Hope your week is lovely in every way. I love your preparations - the chair is delightful. 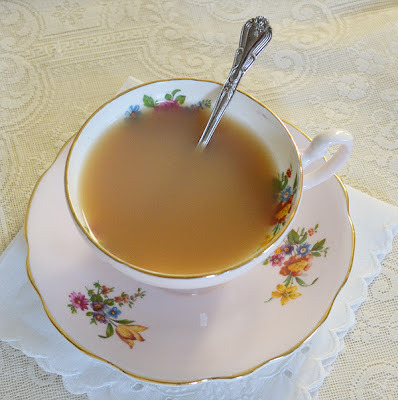 I don't even have a tea blog to share this week - wish I did, I love doing them. I bought some small wooden birdhouses and I am going to paint them to use in the centerpiece for my outdoor tea party - tonight I will put the base colors on - I'm thinking mint, yellow and light lavender. I'm thinking of using my Desert Rose tea set for the dishes that day - I might change my mind, maybe many times before then. It is fun planning. I have already marked this party on my calendar and plan to participate. I am actually excited about it ! The painted chair , WOW ! so excited for the tea on the 25th, not sure what I can come up with, but looking forward to what everyone else does. Unfortunatelly, I am living in Madrid and I don't have a garden to set my tea tent. But at least, I can enter this marvellous blog and enjoy yours! Having a special area in the yard for tea and lots of pretty things to decorate it and enjoy at a moments notice sounds wonderful. Your pictures, tea cups, lace, etc. are so pretty. Great photos. Lovely post, Terri. So nice to have an outdoor tea. By June, it will be too hot here! I'll have tea indoors! Happy Tea Day! Dear Terri, how much progress you have made toward your garden tea. Terri, You are reincarnated English Lady who truly enjoyed her tea, and she did not want the maids to set it up it for her. I love your beautiful paint jobs on the chair and the stool. I don't know if you're aware that were you to use the dark wax, you HAVE to first use the clear wax. I learned this from one who teaches the Annie Sloan techniques. We bought some of Annie's books too that show all sorts of fun ideas, and one is to be able to see the brush strokes for the added dimension. the upcoming party in the garden will be a gorgeous event. I love your preparations. The painted chair is beautiful. 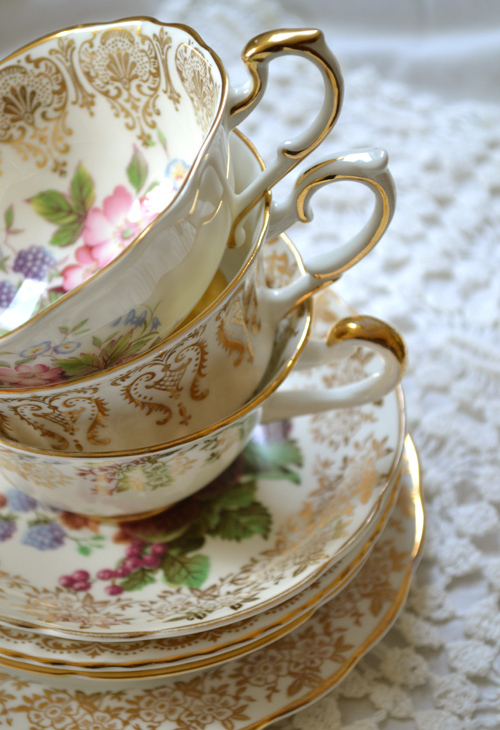 Thank you fo sharing your beautiful china and the nice ideas for the garden party. And for hosting this sweet event. Can't wait for tea at the 25th! I will make mine in the condo's garden and pool, lol.. Thank you for the great tea party! 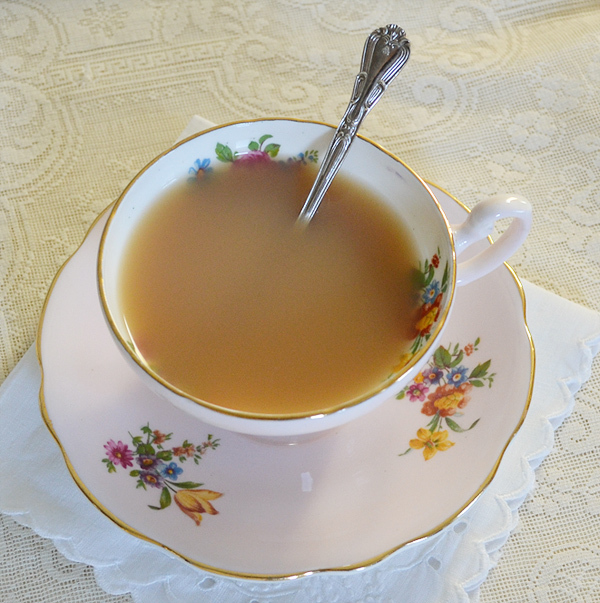 I love your words about having tea, dear Terri, so right for me,too- tea is to relax and find some moment of piece ! I am so exitied to see how you will make that tent- it will be the sweetest little summer retreat for tea and cosy chats- maybe even a glass of wine, in the early evening :-) I can`t wait to see what you have in mind,dear! 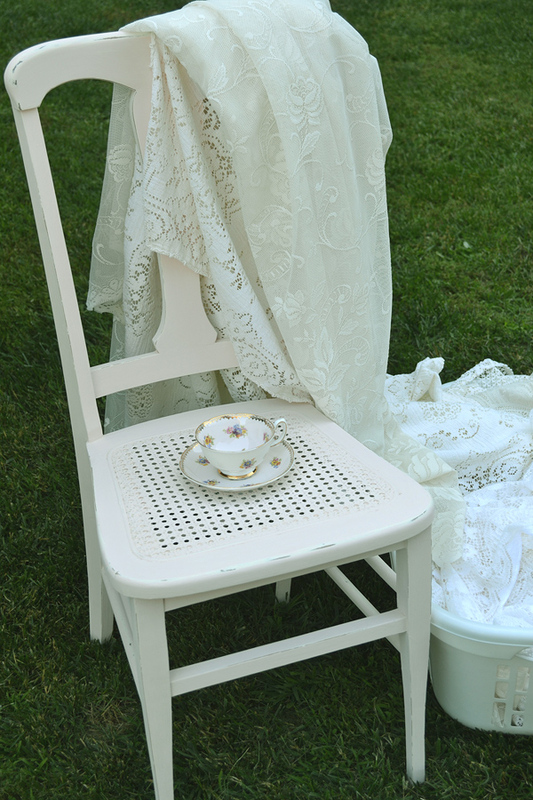 It will be the most lovely tent made from your lace pieces !! Hugs and happy tea tuesday- I will go have my evening cup now !!! I'm running late for linking this week but am really impressed with the AS paints as I read of your experiences. The blue chair turned out fabulous. Must be fun preparing for the tea garden party. Nice tea cups by the way. Hi Terri..hope it's ok to download your gardentea button in case i get a chance to join and play!Yay sounds wonderful!beautiful post! I love your tea garden !!! Every thing you guys arranged in a specific way.Thank you so much for sharing a beautiful tea garden where I could get many appliances of tea sets.